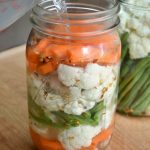 You are here: Home / Food & Recipes / Canning & Preserving / Homemade Dried Cherries Two Ways – Which is Best? Homemade Dried Cherries Two Ways – Which is Best? 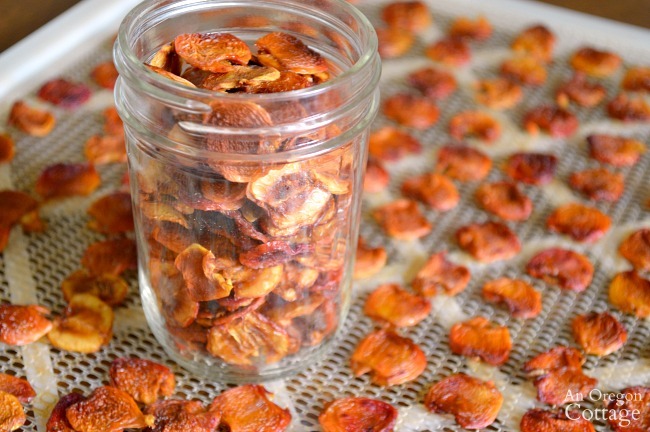 Making dried cherries at home is a great way to preserve cherries with little fuss, plus they’re delicious! 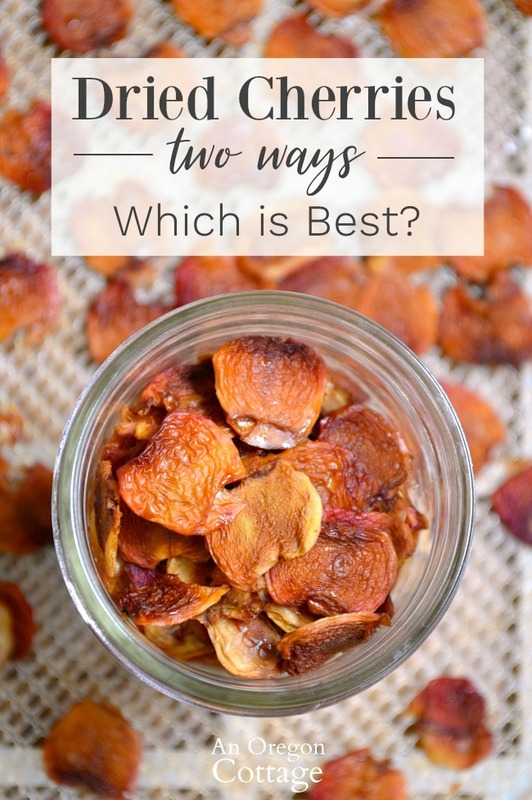 But which is the best way to dry them, whole like the dried cherries you buy at the store or cut in half like many how-tos recommend? I love dried fruit, whether it’s these dried cherries, plums, or blueberries. There I said it. 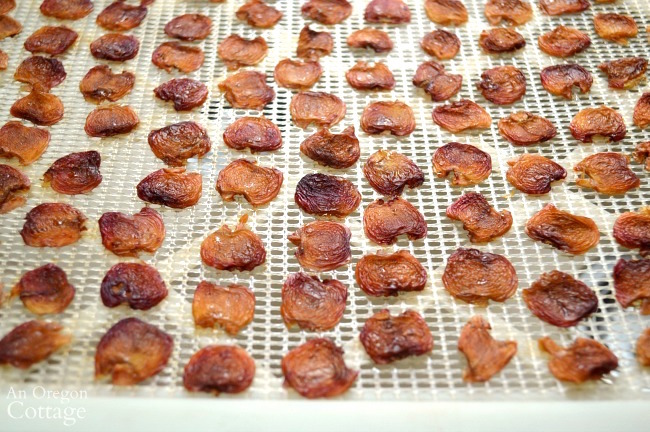 I feel it’s not popular to say you love dried fruit lately since it seems to have gotten a bad rap, mainly because there’s a focus on the sugar. Dentists say it’s just like eating candy to your teeth. Doctors mention how they’d prefer you eat the whole fruit instead to get all the water-soluble vitamins that evaporate along with the water. Nutritionists warn of the increased sugar and calories – and how much easier it is to eat more of dried fruit than fresh. And anti-carb people? Well, they just wonder why people eat fruit at all, lol. But seriously – dried fruit is good for you. Really. Now of course a lot of dried fruit is not. But that also goes for just about anything (okay, maybe not celery – but can anybody really eat a lot of celery?). And choosing dried fruit over chips, fish-shaped crackers, mostly sugar yogurt, and other processed snack foods? That’s a win in my book. Blueberries offer protection against inflammatory free radicals, and can actually enhance your brain cells’ ability to communicate with each other. Tart cherries can prevent bone loss and osteoporosis (just like the dried plums I love so much! ), reduce stroke risk and complications, alleviate muscle pain, and lower arthritis pain and symptoms. 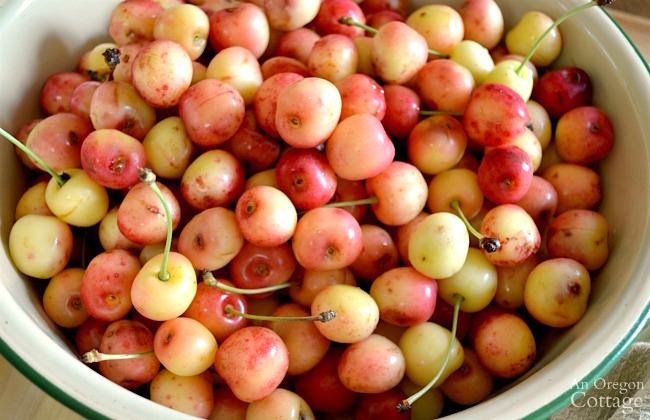 Bing and Rainier cherries are rich in the antioxidants that reduce inflammation, which can help prevent inflammatory diseases. Does dried fruit have more sugar than fresh? Of course. That’s why a serving is usually a couple tablespoons or a quarter cup. Will it spike blood sugar? Probably. But eat a small serving along with nuts to offset the sugar with protein and good fat. Hey! That’s trail mix, isn’t it? Yep – just not the candy-laden mixes that masquerade as ‘trail mix’ these days – mix only nuts and seeds with a few of the healthiest dried fruits for a quality trail mix. It’s a snack I often have, using small cups to keep portions in check. 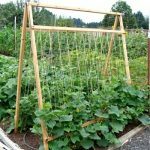 Beyond all this, drying fruit is a time-honored way of preserving fruit – especially fruits with relatively short seasons like cherries. Freeze some cherries, make and can cherry chutney, and by all means make dried cherries at home – with no added sugar – and reap all the nutritional benefits of dried fruit. When our farmhouse fixer’s mystery tree turned out to hold Queen Anne/Rainier type cherries, we were thrilled. We ate and picked (and ate and picked…) for a week and a half before they started to spoil. That’s one short harvest window! And while the color is lighter, these cherries hold all the flavor and much of the same nutrition as the more typical fully red cherries. I preserved them in all the ways mentioned above, but when it came time to dry them, I decided to do a little experiment. If you google “how to dry cherries” most of the articles will tell you to cut them in half (well after pitting – but you have to do that with all preservation methods, so I’m going to skip that. 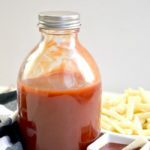 I share my favorite pitting method here if you’re interested). But the dried cherries you buy from the store are all whole. I knew it would take less time to dry half cherries – but would the flavor/texture be different? So I dried cherries both ways – a couple trays with half cherries and a couple left whole. 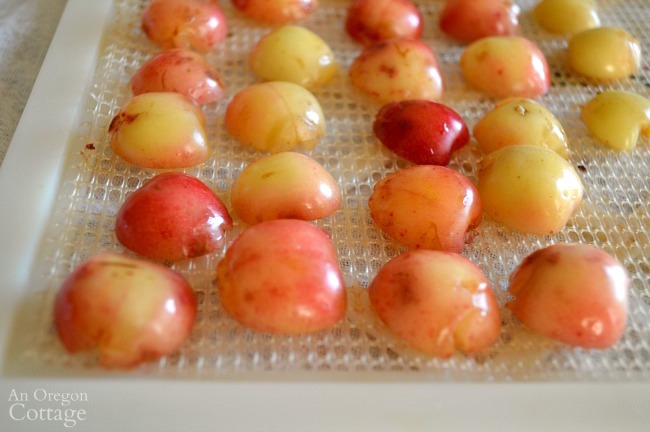 After washing and pitting the cherries (pit six at a time with this tool), you simply place them on a food dehydrator tray leaving enough space so that they are not touching. Pretty easy! Note: my experience is only with drying fruit in a food dehydrator (this is the food dryer I use and prefer). 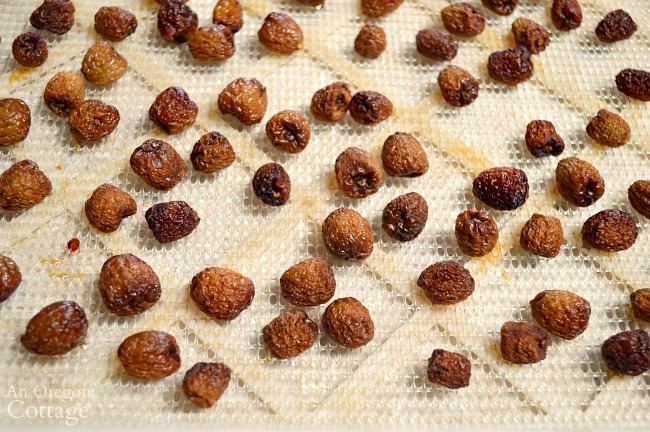 If you don’t own one, here is an article that shares how to dry fruit in an oven. 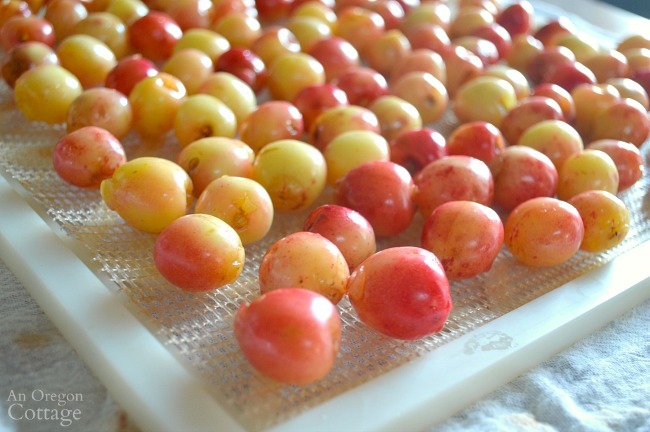 For the cut cherries, wash, pit, and cut each in half. Lay the halves cut side down on the food dryer trays. This of course added time to the prep – I counted about 45 minutes more than the same amount of trays with whole cherries. Dry at 135 degrees (the fruit recommendation on my food dehydrator) for 8-10 hours. Check fruit. 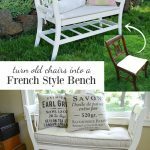 Remove any that are fully dried (pliable, but not squishy – you pretty much have to touch each one to know, unless you can see they are still wet-looking). Dry 2-6 more hours or until all the fruit is dry. Dry at 135 degrees (the fruit recommendation on my food dehydrator) for 6-9 hours. Check fruit. Remove any that are fully dried – most will be at this point. Dry 2 more hours or until all the fruit is dry. So Which Dried Cherry is Best? Well, from my perspective there was no clear winner. Shoot – it’s always better to be able to say one or the other, isn’t it? I do have a preference, though you have to make up your own mind I think. The cut cherries were more time-consuming to prepare. This is hands-on time, so if you’re short on that, this might not be the way to go. The whole cherries took longer to dry. Like hours longer. BUT, it’s all hands-off time, so there’s that. If electricity is an issue, this might be a deal breaker. The cut cherries didn’t really feel like the dried cherries I’m used to eating. And oddly, they didn’t seem to have as much “cherry flavor” as the whole. The whole cherries don’t look as good, but the flavor and texture is superior, I think. So for me, I think I’ll opt for whole dried cherries. The less time to prep and the better eating experience wins out for me over the longer drying time. Which way do you think you’d like to dry cherries? Thanks for this. I’m getting ready to dry cherries tomorrow!